Nepal was declared a Hindu kingdom by the 1964 Constitution and the Panchayat system further demonstrated Nepal as a Hindu kingdom at the global level and created a nationalist feeling. This scenario continued more or less. Subsequently, however, pro-secularism voices were often heard from the Maoists. On February 4, 1996, Baburam Bhattarai and Pampha Bhusal submitted a 40-point memorandum to then Prime Minister Sher Bahadur Deuba, which include the suspension of Nepal as a Hindu state and declaring it secular. Since the insurgency, secularism has been a political agenda of the Maoists and it later became part of the historic 12-point agreement. When Nepal was declared a secular state by the 2007 Interim Constitution, voices of dissatisfaction were often heard. However, after the demise of the first Constituent Assembly (CA), the issue of secularism hasn’t been raised by the major political parties, whereas the Rastriya Prajatantra Party-Nepal led by Kamal Thapa, who contested the election on an anti-secularism plank, emerged as the fourth major political party in the second CA. Besides Kamal Thapa, none of the other political parties have openly opposed a secular state. And secularism was a political agenda of only the Maoists. After the 2006 Janaandolan, it seemed secularism became a political agenda of the Nepali Congress (NC) and the CPN-UML too, not by choice but as a result of political bargaining. It has been more than five years since Nepal turned into a secular state. But it has remained so in theory, only because the head of state and other government office bearers still follow traditional Hindu rituals. Similarly, a provision in the Muluki Ain remains unchanged. Number 11 of Chapter 7 states that a person who knowingly kills a cow shall be jailed for 12 years. The punishment for instigating the killing of a cow is six months in jail. We have been practicing secularism in theory but not in practice. The achievement of a secular Nepal so far has been that the number of Hindu holidays has declined and the government has declared holidays for the indigenous communities, Christians and Muslims as public ones. According to the 2011 census, 10 major religions are practiced in Nepal, among which Hinduism is followed by 81.3 percent of the population. Buddhism, Islam, Kirat, Christianity and Prakriti are followed by 9 percent, 4.4 percent, 3.1 percent, 1.4 percent and 0.5 percent of the population, respectively. The 1959 Constitution of Nepal upheld the principle of equality and gave citizens the freedom to practice and profess their own religion. However, the 1962 Constitution declared Nepal a Hindu kingdom. The question is why was there a need to declare Nepal a Hindu kingdom? There could be three reasons. First, maintaining the identity of the country as Hindu. Second, as the 1962 Constitution has mentioned the king as being an adherent of the Hindu religion, declaring Nepal a Hindu kingdom would symbolise king’s rule. Third, the 1960s were a period when lots of Christian missionaries came to Nepal. So it could be that the state was afraid that they would encourage religious conversion and felt the need to assert Nepal as a Hindu kingdom. After the declaration of Nepal as a Hindu kingdom, the new Muluki Ain was promulgated, which removed to some extent discrimination on the basis of religion and caste. But demands to turn Nepal into a secular state were not heard often. This scenario continued till 1990. When the 1990 Constitution was being drafted, the Nepal Buddhist Association called for a secular state by organising a demonstration on the streets of Kathmandu. However, its demand was rejected and the 1990 Constitution declared Nepal a multiethnic, multilingual, democratic, independent, sovereign Hindu constitutional monarchical kingdom. It is often argued that secularism promotes political protection of religious minorities. It is also believed that secularism brings a sense of security and equity to religious minorities. Perhaps religious minorities view a secular state as the guardian of minority rights against the religious majority. However, it’s not easy for Nepal to implement secularism as the concept itself has so many approaches, which has led to different models of secularism. It’s very unfortunate that political parties have not realised the importance of debating secularism. During conversations among Hindu citizens, I have come across a few common voices regarding the way of life under secularism in Nepal, and the discussion ends with a few unanswered questions: (1) What will be the fate of secularism in new Nepal? ; (2) Even if secularism is promulgated though the new constitution, will the rituals being followed for years continue? 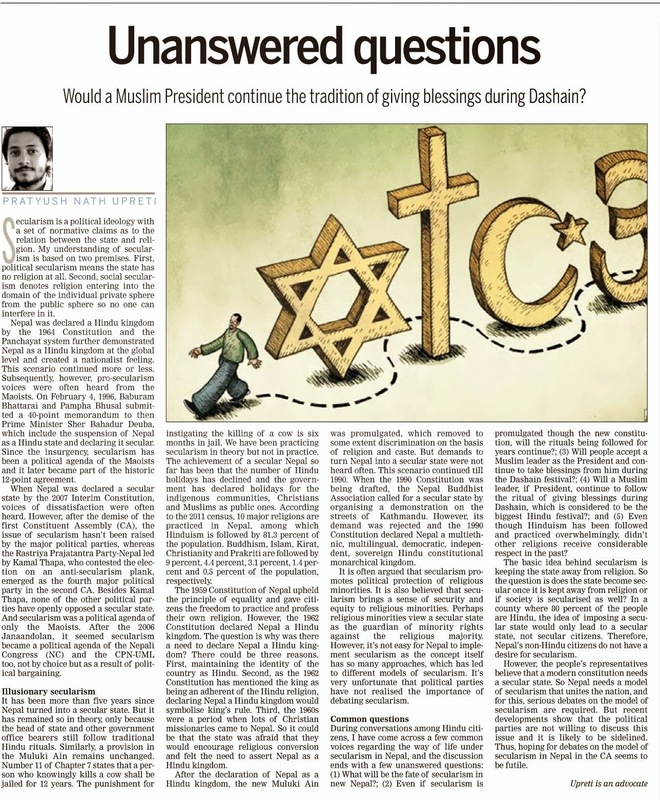 ; (3) Will people accept a Muslim leader as the President and continue to take blessings from him during the Dashain festival? 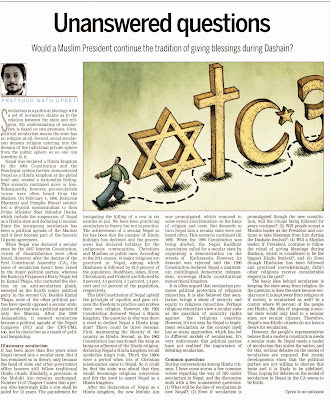 ; (4) Will a Muslim leader, if President, continue to follow the ritual of giving blessings during Dashain, which is considered to be the biggest Hindu festival? ; and (5) Even though Hinduism has been followed and practiced overwhelmingly, didn’t other religions receive considerable respect in the past? The basic idea behind secularism is keeping the state away from religion. So the question is does the state become secular once it is kept away from religion or if society is secularised as well? In a county where 80 percent of the people are Hindu, the idea of imposing a secular state would only lead to a secular state, not secular citizens. Therefore, Nepal’s non-Hindu citizens do not have a desire for secularism. However, the people’s representatives believe that a modern constitution needs a secular state. So Nepal needs a model of secularism that unites the nation, and for this, serious debates on the model of secularism are required. But recent developments show that the political parties are not willing to discuss this issue and it is likely to be sidelined. Thus, hoping for debates on the model of secularism in Nepal in the CA seems to be futile.